A few years ago, when I’d go off on a tangent about postwar Japanese photography and photobooks with friends, I’d usually get polite yawns or blank stares. An IT / systems administrator friend would humor me by listening intently and then responding with complete non-sequiturs about LDAP and mail server protocols – to which I would also listen politely. It was an ongoing amicable pseudo-dialogue between two friends who knew nothing of the details of one another’s obsessions. So, imagine my pleasure and surprise in the last two years when several of my non-photobook-geek friends started sending me links to articles and posts about postwar Japanese photography and photobooks. Finally, the tide was turning in western circles and knowledge about postwar Japanese photography was expanding as a result of several recent exhibitions and important publications on the topic. I could say the name Daido Moriyama and friends would nod knowingly, several even mentioning his association with Provoke. But what exactly “Provoke” represented and who else was involved was a bit fuzzier for most. Many (including myself) still use the term in its most general sense to describe an are-bure-boke (rough, blurred, out-of-focus) visual sensibility from the late 1960s to the mid-70s. Specificity of it being a short-lived small-press photography magazine is less known. 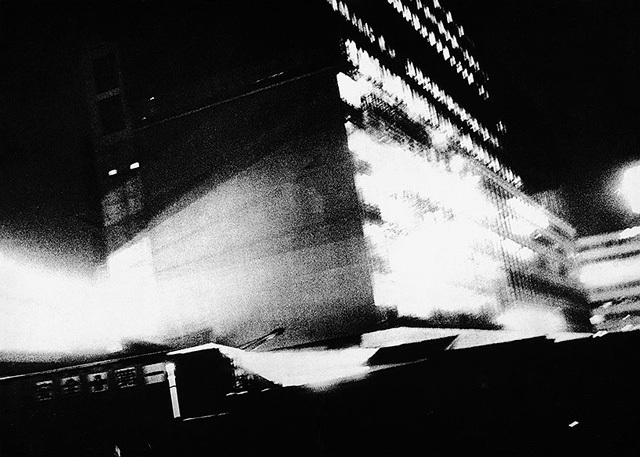 Begun in November 1968 by a progressive collective of writers and photographers, which included Koji Taki, Takuma Nakahira, Takahiko Okada, Yutaka Takanashi, and Daido Moriyama (who joined with the 2nd issue), Provoke magazine, subtitled Shiso no tame no chohatsuteki shiryo / Provocative Resources for Thought was a radical rethinking of prevailing photographic conventions. Lasting just three issues and culminating a year and half later with First Abandon the World of Pseudo-Certainty, a summary book often cited as Provoke 4 and 5, the publication’s platform united five individuals, who despite being quite distinct from one another were able to briefly band together and set a course that would transform Japanese photography. The ambitious mission of Provoke to create a new photographic language that could transcend the limitations of the written word was declared with the launch of the magazine’s first issue. The year was 1968 and Japan, like America, was undergoing sweeping changes in its social structure. A questioning of traditional social conventions and a loss of confidence in existing political powers was happening in many creative disciplines across Japan and formed the foundation that fueled Provoke’s mission. Unified under a manifesto that advocated conceptualism over realism, Provoke‘s photographers and writers moved beyond issues of what to photograph, and sought to uncover and question the essential nature of photography itself. The visual results flouted the precision of earlier documentary modes in favor of a less focused imagery that allowed for chance and the unknown to reveal itself in the photographic process. It is for this reason, that more often than not, general surveys of 1960s/70s Japanese photography attribute the catchall phrase of “are-bure-boke.” However, the aesthetic reality of the individual Provoke photographers can be better understood in an analysis that moves away from a one size fits all categorization and looks to the subtle and nuanced differences that define their unique artistic vocabularies. 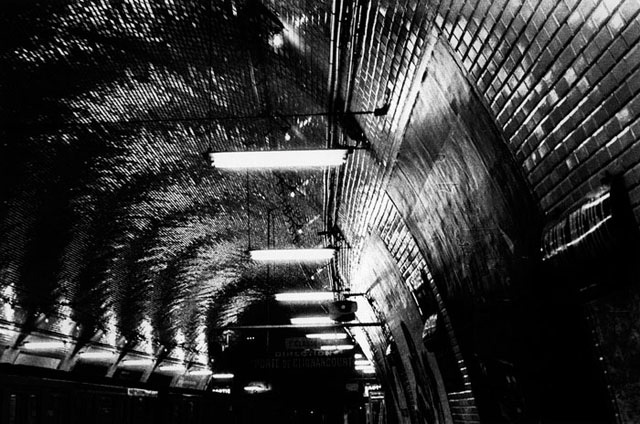 Over the past few years, with the combination of an increased interest in the work of Daido Moriyama, the release of numerous Provoke member facsimiles and reprints, and the publication of several English language reference sources, interest in this collective has expanded to finally allow a review of the variations that define the individual Provoke photographers. Two figures in particular, Takuma Nakahira and Yutaka Takanashi, are now receiving significant attention as a result of a 2012 Takanashi exhibition in Paris and the recent publication of monographs and reprints by both photographers. 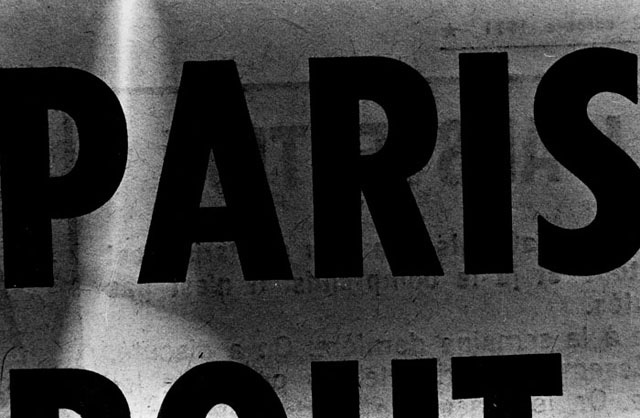 Nakahira’s seminal 1970 monograph For a Language to Come (2010 reprint) and his Circulation: Date, Place Events (2012) collection of Paris images from 1971 reveal his quest to capture a world that is unseen by the human eye; a dark brooding visual space on the precipice of the unknown that can only be exposed through the lens of a camera. Sporadically interrupted by people, his photographs in For a Language to Come conjoin landscapes and urban-scapes as he pushes images to the edge of what is recognizable. He contorts and reshapes forms into a language beyond words as he balances fragments of a reality that is simultaneously known and otherworldly. The results are an affirmation of the tenants first introduced in the1968 Provoke manifesto, “Today, when words are torn from their material base – in other words, their reality – and seen suspended in space, a photographer’s eye can capture fragments of reality that cannot be expressed in language as it is” (qtd. in Badger and Parr, “The Photobook: A History, Vol. 1” 270). Nakahira’s blurry images are not a simple disregard for the conventions of photography, but rather a conscious effort to reveal the unconscious as he takes the ingrained idea of what something is and turns it on its head. In the autumn of 1971, Nakahira was invited to participate in the Seventh Biennale of Paris. Arriving at the deserted exhibition hall in an eastern Parisian suburb, Nakahira was disappointed to find “so-called ‘contemporary art’ reaching the culmination of its own fully exposed ‘futility’” (Nakahira, “Circulation” 291). In response to the pessimism that the Biennale evoked, Nakahira decided to rethink his participation. Rather than exhibit the photographs he had brought with him from Japan of compressed and fragmented environments verging on the abstract, his response was to once again question the nature of photography and set himself a framework that would be dictated by the “here and now” of the Paris he was living and experiencing. By embracing the unknown “assaults” of his Parisian surroundings, Nakahira set out each day to photograph the streets, the exhibition hall, and anything else that crossed his camera’s lens. Later each night, he developed the results into 8×10 prints, which he would then exhibit the following day in the Biennale space allotted him. By the end the week, Nakahira had exhibited 1500 photographs. More distinct and recognizable than the earlier images presented in For a Language to Come, the Paris photographs of Circulation: Date, Place, Events once again transcend a direct representation of the city itself in favor of a second reality that reveals a world at the edge of consciousness. It is a parallel space that is decidedly familiar — even mundane – while it very subtly hints at the unknown. On first glance the work of Yutaka Takanashi seems incredibly similar to the dark brooding landscapes and cityscapes of Takuma Nakahira. There is the familiar blurry image quality and the visually indecipherable that hangs at the edge of reality – yet there is also a lightness and hint of openness that lifts Takanashi’s images beyond an apocalyptic pessimism of no return. His work first came to the attention of Nakahira in 1966, when he contributed several of his Tokyo-jin (Tokyo People) photographs, which initially appeared in a 36-page feature in the Japanese photography magazine Camera Mainichi, to a group show at the National Museum of Modern Art. Nakahira, who was then an editor at Gendai no me (Modern Eye) magazine, was immediately impressed by Takanashi’s photos of densely populated Tokyo streets throbbing with the newly minted salarymen and office ladies of the postwar era. He invited Takanashi to join him, Okada and Taki in co-founding Provoke magazine. 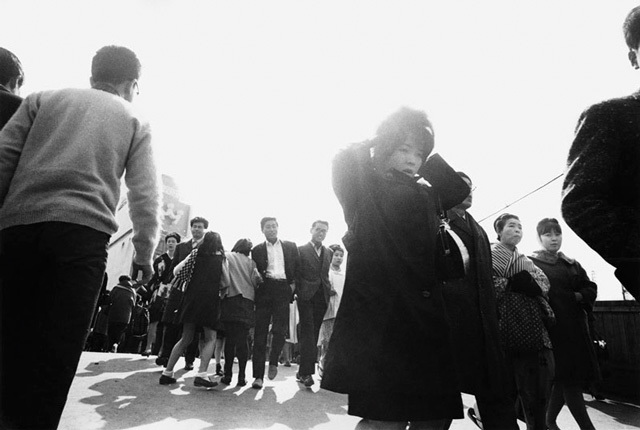 The subsequent photographs that Takanashi took during this period also form the basis of his 1974 book Toshi-e / Towards the City, which is often considered the final phase of the more general Provoke period. Clearly revealing an admiration for and an allegiance to the photographs in Nakahira’s For a Language to Come, Takanashi’s Toshi-e images are presented within an elaborately stark, yet beautiful photobook designed by the incredibly inventive Japanese graphic designer Kohei Sugiura. Encased within black cloth covered boards inlaid with a gleaming silver disc, Toshi-e is actually two bodies of work: the raw, often somewhat deserted Nakahira-inspired spaces of the hardcover, and the densely populated images of Tokyo-jin, which are presented almost as an after thought in a more modest booklet that accompanies the hardcover volume. Together, these landscapes and cityscapes elucidate Takanashi’s all-pervading interest in the city — its rhythms, tempo, and the potential for alienation. With the city as his primary means of chronicling a Japan in transition from agrarian culture to urbanization, Takanashi not only speaks to the alienation that comes with a modernized Japan, but also to the inevitable loss of century old traditions. Toshi-e was reprinted in 2010 by Errata Editions in their Books on Books series, an ongoing project to reprint rare and out-of-print photobooks. As a Provoke member, Takanashi was never exclusively a photographer of blurry images. A recent photobook, which accompanies a 2012 exhibition of his work at the Fondation Henri Cartier-Bresson in Paris, presents the opportunity to see two distinct sides of Takanashi’s visual sensibility from the late 1960s and early 70s. 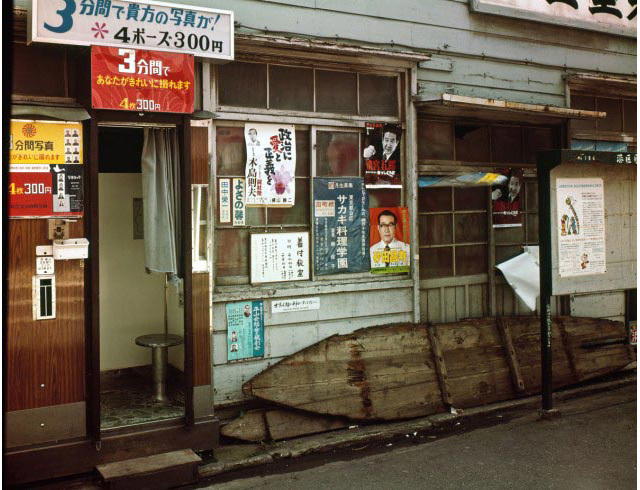 Organized into three sections, Yutaka Takanashi published jointly by RM Verlag and Toluca Editions presents his iconic black-and-white Toshi-e images as the second sequence between two color series that came shortly afterwards: Golden Gai Bar and Machi. The direct, more documentary approach of these photographs also explores a Tokyo in transition, but with a sense of optimism and warmth that is less visible in the more alienating images of Toshi-e. 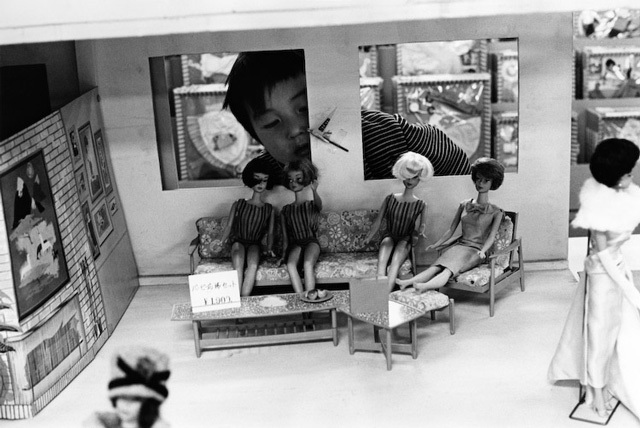 In the insightful essay, which complements the three series presented in the book, photo historian Ferdinand Brueggemann rearticulates Takanashi’s comments about his work from the 1966 Camera Mainichi “Tokyo-jin” feature, “As a photographer, he moved between two extremes – on the one hand, a ‘hunter of images’ who aims to capture the invisible; on the other, a ‘scrap picker’ who only picks up what is visible” (27). It is these two sides of Takanashi, which can clearly be seen in the 3-part sequencing of the Henri Cartier-Bresson exhibition book, Yutaka Takanashi (2012). His Toshi-e photos show the Provoke hunter who seeks to unearth a new language, which lies at the periphery of consciousness; while the Golden Gai Bars and Machi series show the scrap picker who revels in the ordinary and the daily quiet rhythms of urban neighborhoods or “machi.” However, unlike Nakahira’s 1971 Paris photos, which seek to transcend reality in his search for a new language at the boundary of the photographer’s lens, Takanashi’s Machi and Golden Gai Bar “scraps” are all about the here and now in a concrete sense — the reality that is in front of his camera. More than just blurry and out of focus, Provoke magazine was the work of five very different and distinct photographers and writers: each with a range of aesthetic styles that continued to evolve for many years after their Provoke involvement. To just stop at the scrap picker / hunter duality of Takanashi or Nakahira’s new language for a reality at the edge of consciousness is to miss an opportunity to fully explore each of the five artists who formed Provoke. For example, in 1973, Nakahira destroyed much of his Provoke work and commenced a series that favored a simple depiction of reality similar to the indexing of an illustrated dictionary…but that is the basis for another post. With more now being written in English on all five Provoke collective members and future shows being organized, perhaps my non-photobook-geek friends will start sending me links to articles on Takahiko Okata and Koji Taki…and *gasp* post-Provoke works! Takuma Nakahira, Circulation: Date, Place, Events (Tokyo: Osiris, 2012). Recent acquisition. Not yet cataloged. This entry was posted in artists' books, Exhibitions, International, New Acquisitions, Visual Research and tagged Books on Books, Daido Moriyama, Errata Editions, Fondation Henri Cartier-Bresson, Japanese magazines, Japanese Photobooks, Japanese Photographers, Nakuma Takanashi, Provoke, Provoke era, Russet Lederman, Yutaka Takanashi. Bookmark the permalink.